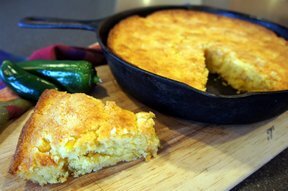 A sweet cornbread that will please everyone. 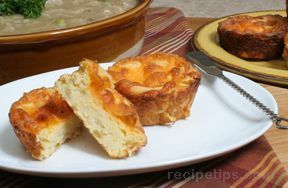 Baked to a golden brown, its the perfect side to your meal. 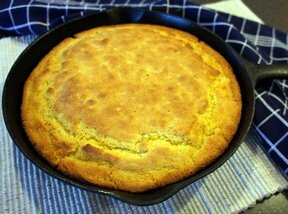 Served with maple syrup, it soaks right into the corn bread. Preheat the oven to 425 degrees. Add oil to cast iron skillet and place in oven while preheating. 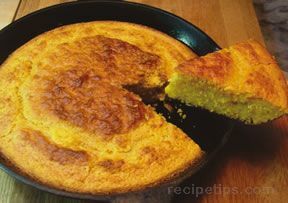 In a large mixing bowl, blend corn meal, flour, baking powered and sugar. In another bowl, whisk together milk, eggs and melted butter. Add this mixture to corn meal mixture and blend together thoroughly. Next using oven mitts, carefully remove the skillet from the oven. Pour batter into the skillet and return to oven. Bake for about 15-20 minutes or until a wooden toothpick inserted in the center comes out clean. Serve with soft butter and honey or maple syrup. "Great side next to my BBQ ribs."